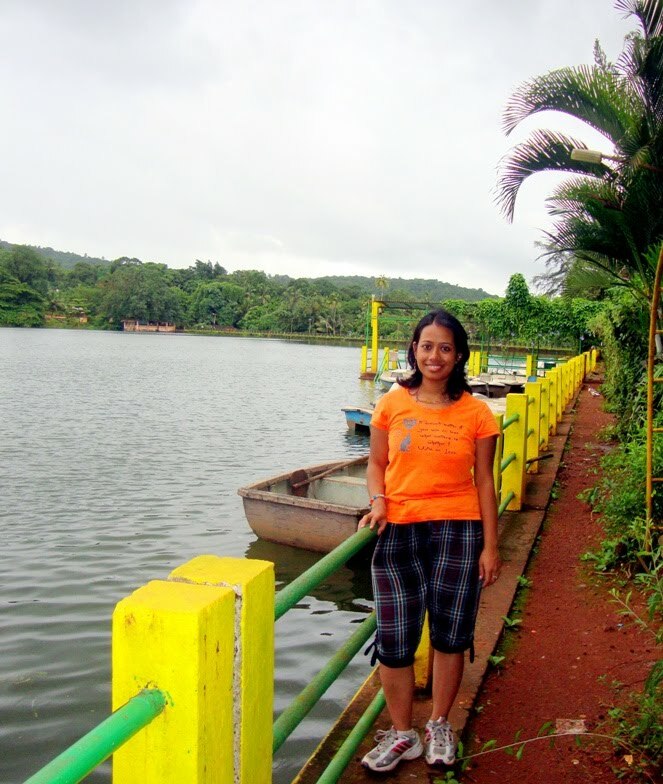 Let Me Speak (LMS): blog of atanu phukan...: Trip to Goa, an experience to cherish…. Trip to Goa, an experience to cherish…. That’s what has been happening to me lately when I decided to go on a vacation. It was also time for my first wedding anniversary and wanted to have some time out with my wife. Started exploring locations, when Goa came to my mind. I have been to Goa many times, but this time I wanted to make it different. Wanted to spend a whole week there and explore the places I haven’t seen before. It was the first trip for my wife and thus kept all the standard places also in the itinerary. Booked the hotel (http://www.marquis-beach-resort.com/) as well as railway tickets (http://www.irctc.co.in/). Planned things well in advance so that it is available. 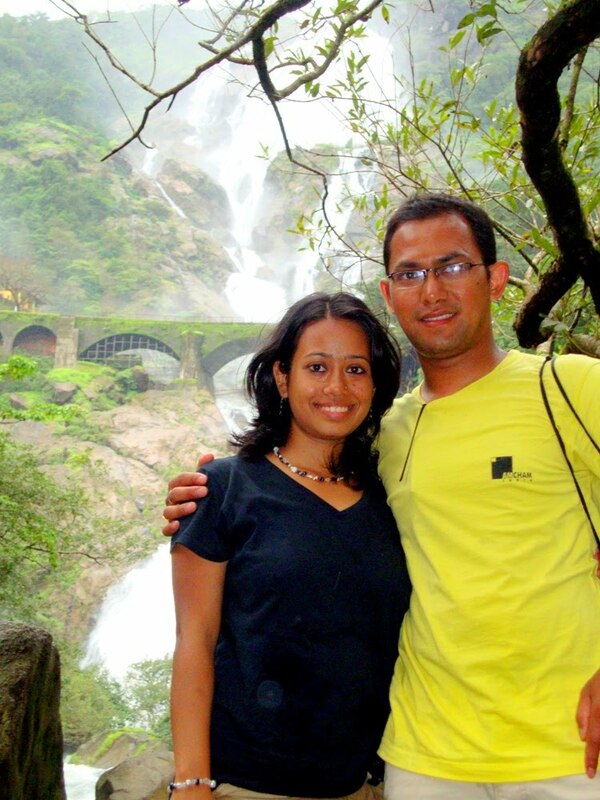 Traveling to Goa from Bangalore via train is an awesome experience for couple of reasons. Firstly, you go via the ghat section and the route is very scenic with great view of greenery and forests and also few lovely tunnels on the way. The tunnels are fun when the lights go off suddenly and people scream their throat out for fun :-). 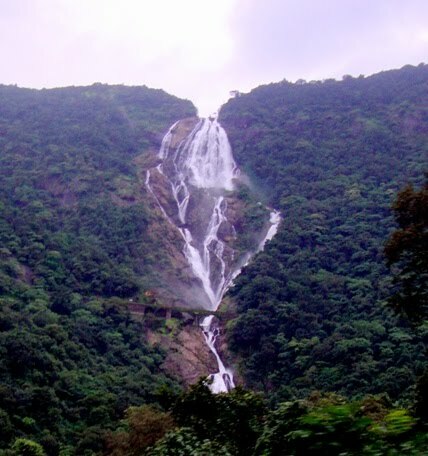 Secondly and most importantly, you get to see the Dudhsagar waterfalls from the train (both from close-up and from a distance). 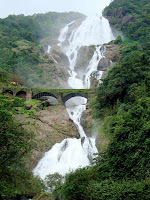 It was monsoon time in Goa, and I had the opportunity to see the waterfalls when it was at its best. Overall the train journey was awesome and geared us up for our week-long vacation in Goa. We headed straight to the “Baga Beach”. Surprises waited us at the beach when we reached there. There were no water sports, nothing at all. My wife was really upset. Really, really upset. And also a difference from my last visit was there were lots of lifeguards stationed near the beach. I checked with one of them and I was informed that due to monsoon the sea is quite violent now, so there are no water sports around. (and I thought it was global warming, ha ha).The sun was shining really bright, and it made us more upset. Rented out a beach bed for some rest. There were vendors all around trying to convince us about having a tattoo. My wife wanted to have one and choose a flower-butterfly combination to have it on her arm. It came out really pretty. We spent some time playing in the water. Without any water sports there was nothing else to do. But being in the sea is always fun. Adults becomes kids, :). We finally headed out for lunch and planned to spend the evening somewhere else. Had lunch in a restaurant called the “Fisherman’s Cove”. 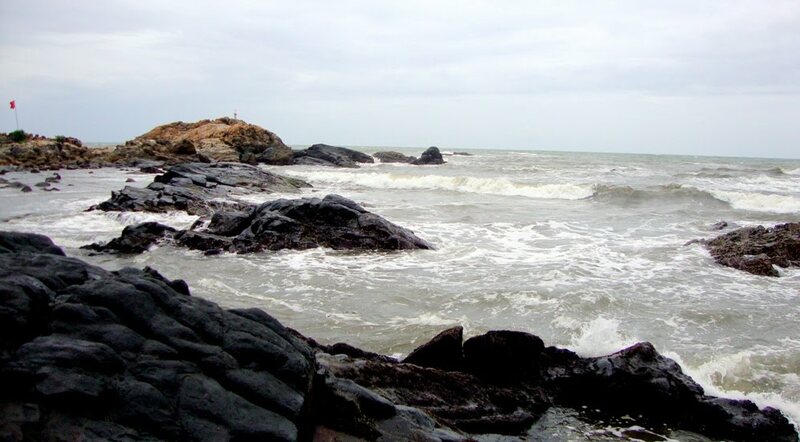 It is located at the Calangute – Candolim road. Nice place, but the food was awful. (I am still not sure why we saw it quite crowded all the time we spend there. May be tried the wrong menu). Headed back to the hotel for some rest. “Fort Aguda” was very near to where we stayed. So planned to spend time out there in the evening. My wife tried out her new dress, a nice cute black skirt. “She looked great”. 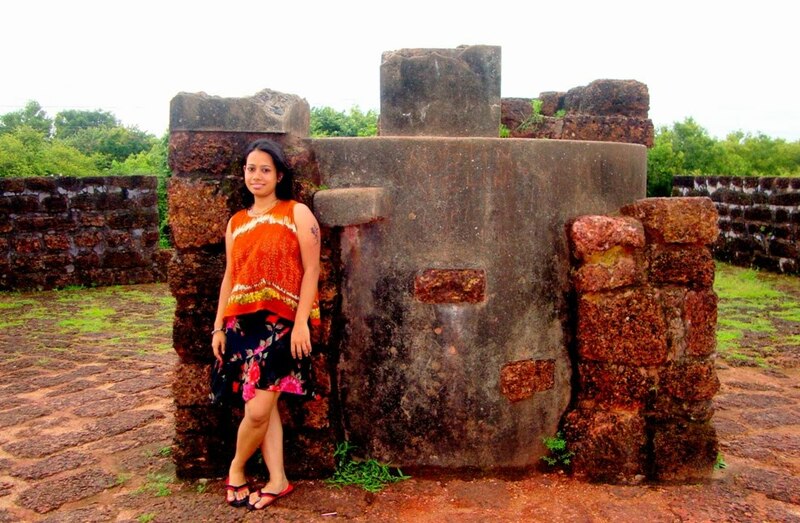 Fort Aguda, as the name suggests, was a place for providing ‘aqua’ to the ships at anchor. 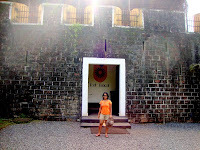 Part of the Fort is now converted into a 5-start hotel part of it a Jail and part of it open for visitors. We first went to see the Jail. On the way there was a private villa belonging to a person from Mumbai. 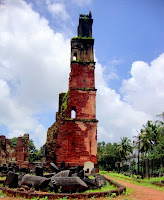 (I think its also part of Fort Aguda. Not sure how he bought it). The jail is not open for tourists, and it looked very old and ill maintained too. Took a snap and headed back to the main fort. 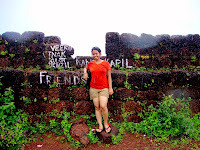 Fort Aguda is surrounded by sea on one of its side. The other sides have huge trenches built in and made accessible via a single path. It has open space in the middle surrounded by huge walls. The tank is situated in a corner near to the entrance. We roamed around enjoying the views and capturing the memories in our camera striking poses. The view of the sea from the fort was breathtaking. The lighthouse was also visible at a distance. Spend some more time around there and it was time to head back. Surprise waited us in the morning. Off-season surprise at the hotel; they are going to serve us the same breakfast even today (well we came to know later that they will serve us the same breakfast every day. We used to joke in the breakfast. When the waiter comes to take the order, we tell him bring the usual, ha ha). The second surprise was monsoon. It started pouring heavily and didn’t seemed to stop. It continued on and off until lunch. We decided to have lunch at the hotel itself. instead. 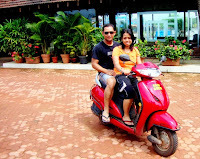 Took our Activa and hit the roads to Panjim. Found our way through asking peoples to reach the location for river cruise. Booked to tickets at “Royal Cruise”. We still had couple of hours in hand. Instead of waiting there we headed to the “Dona-Paula beach” (on the way got a glimpse of Miramar beach). Dona-Paula is at the extreme end of Panjim. Some of the official buildings are also located nearby. It’s a rocky beach too, with nice view. My wife was happy to finally see some water sports around, jet skiing. We first moved ahead to the viewpoint. There was the telescope guy who was charging some money to show us some important landmarks. Before we leave the place it was time for the water sports, jet skiing. My wife went ahead to tried it. She was braver then I expected (ha ha), enjoying every bit of it. We returned back to our river cruise. 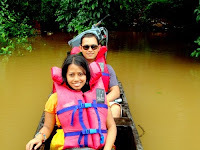 River cruise in Mandovi River is an attraction in Panjim. It started at 5:30 pm in the evening. River cruise consists of dance performances by local artists and time given for the tourists to try their dancing talents (ha ha). The cruise ship (its not actually a ship, more like a ferry) was completely full. It was getting dark and the view from the ship was amazing. There were many other cruises and the brightly lit ships passing by looked beautiful. The attraction on the ship was one drunken dancer. 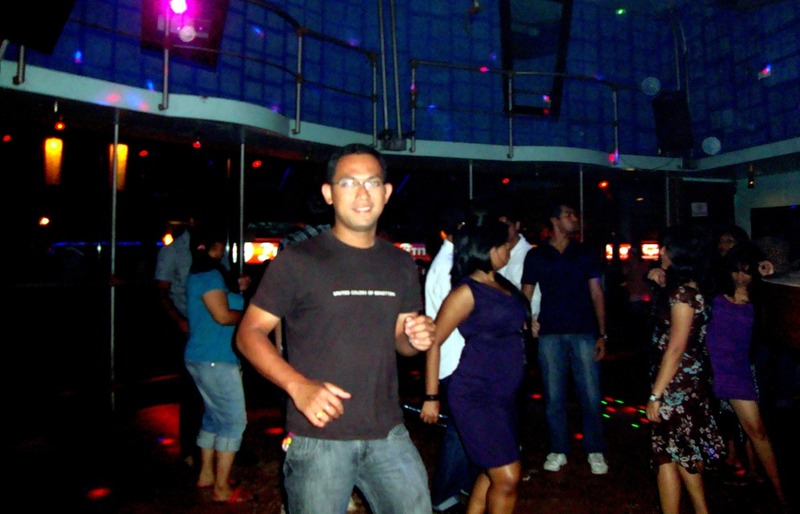 His dance steps reminded me of my college days when we used to have some friends showing similar drunken dance skills (ha ha). Time to bid goodbye. It’s my anniversary day, so planned for dinner at “Sweet Chilly”. It’s a nice restaurant on way to fort Aguda. It is decorated by bright red lights, which look like chilly. Nice green ambience. The dinner was lovely, and the day that started wet ended great. Time for some nice sound sleep. Planned the day for visiting places nearby Goa. Started the day with “Same Breakfast” (ha ha). Had a small walk around the resort. They have a nice small pond with fishes. A walkway from the restaurant takes us through their garden to the beach. There were renovation work going on, and the sea was also quite violent for a very small beach space. We did not move down and had a nice view of the sea from the top, and also got a closer look at the wrecked ship. Spent some time there and headed back to our room to get ready for the day. First place on the list was “Dr. Salim Ali Bird’s Sanctuary”. 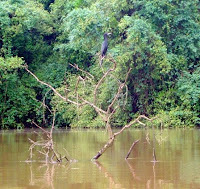 It is located near Panjim at the Chorao Island. 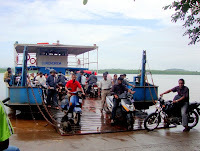 After reaching Panjim, you have to take the old goa road and stop by the Ribandar ferry ghat. The ferry plies every 5 minutes (there are couple of them simultaneously ferrying people from both ends). The ferry transfer is free of charge for people and 2-wheelers. They charge a nominal fare of INR 10/- for 4-wheelers. The view from the ferry reminded me of the river cruise. We can see the bridge at Panjim city. Chorao Island is at Mandovi river. The entrance to the bird sanctuary is located right beside the Chorao ferry ghat. There was a small government run office. When we checked out they informed us that the entry fee is INR 100/- and an additional amount for cameras. We can walk through the sanctuary, which is about 2-3 kms long. The preferred ways to visit the sanctuary was through the backwaters of Mandovi River and take a boat ride. Since it is an off-season, there are no govt. boats at that time. But he informed me that there are private run ones, and he can hook me up with them. He also asked us to visit the Mayem lake, and Arvalem Caves & Waterfalls. Got to know Uday T. Mandrekar, a private boat owner who is also an birds watching guide. It was time to negotiate the amount we need to pay for the boat ride. He finally agreed for INR 500/- for a 1.5 hrs ride. Govt. takes INR 100/-, which totally made it INR 600/-. We followed him to his house and he took us to his boat. The boat was the thin long type, machine powered. The boat initially looked scary and tough to balance. But once we started cruising through the backwaters, the fun started to begin. It was the beginning of the season for birds to come. Saw quite a few of them, kingfisher, storks, kites, and a few I can’t remember. He took us through the mangroves trees to a place for bird viewing. There were many peacocks. Huge storks made sound from their wings when flying. He then took us to a place where we say crabs moving around the trees and branches. We saw fisherman’s hut. These are small huts, resting above the water, where fisherman stays at night during their overnight fishing trips. There were places, where fisherman, to catch their fish, diverted waters. Wind suddenly started blowing and the waters started to become more wavy (and scary). It was also times-up and we headed back to the shore. We bid him goodbye and thanked him for this great experience. He gave us his card (Uday T. Mandrekar – 0832-2239114, 9822583127). We now moved ahead towards “Mayem Lake”. This lake is on the way to Bicholim, ~ 10 kms from the bird sanctuary. They charge an entry fee of INR 10/- for adults. It was neatly maintained and had boat ride facilities. Did not spend much time there (not interested in this boat ride after the great one we just had). We headed for Bicholim for our lunch. “Arvalem Caves and Waterfalls” are on the way to Valpoi. You have to take a right turn just after Sanquelim (~ 7 kms). After parking our vehicle, we walked down some very slippery steps (almost falling down couple of times). There is a temple at the base, and we can hear sounds of water falling besides it. We took few more steps upwards from the side of the temple; and there was the Arvalem waterfall. I was not sure if because it was monsoon, it was violent and thus was too gorgeous. It looked almost 40 feet tall, and huge water falling down was creating water droplets that felt like rainfall. We got completely drenched, but enjoyed it. It was time to capture it in our camera. My wife was suddenly thrilled to see a rainbow beside the waterfall, and I was excited too as I haven’t seen a rainbow in years. Time for more click, click. We next went ahead to see the caves. The caves looked as if there were from a very old time, made from porous black rock. Couple of the caves hosted shiva-lingam. It was a lot to handle for the day and we headed back. Took the ferry ride to Panjim and then back to Candolim. Time for dinner and we headed to “Souza Lobo”. They serve awesome seafood. I ordered an grilled fish. What came to us was a surprise, a huge fish grilled and beautifully decorated. I had tough time finishing it up. I needed some real big breaks and lots of motivational words from my wife before I finally finished it. The goa trip has started getting better by the day. I love Goa. This day is to check the other beaches in Goa. 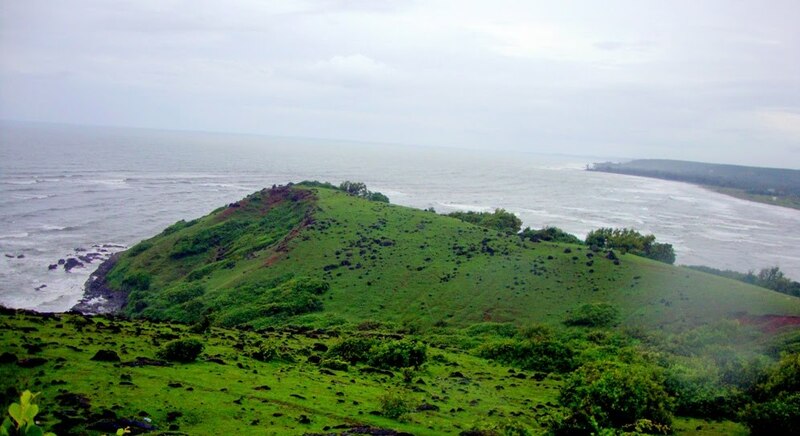 The famous beaches further north are Anjuna and Vagator. We started the day with the same breakfast (ha ha). Our first destination was “Chapora Fort”, better known from one of my all time favorite movie Dil Chahta Hain. Chapora fort is located at the end of the Vagator beach, built to ward off attacks from the Maratha warriors. Parked our vehicle at the base and walked up the hill towards the fort. The fort is in quite a ruined shape. Its wall encloses a vast open area. The best part was the view of the beach, BREATHTAKING. On one side was the Vagator rocky beach, where the water hits the beach creating beautiful white waves. On the other side is the Morjim Beach, where the waves gradually die down before entering the backwaters. There is an extension of the landscape that goes further towards the beach from the fort. We decided to go on a small trek, expecting more breathtaking views. The walk was worth it, as from the end of that, the view was even better. We spent some time there before deciding to try other things out. After a nice lunch we moved ahead to the “Anjuna Beach”. 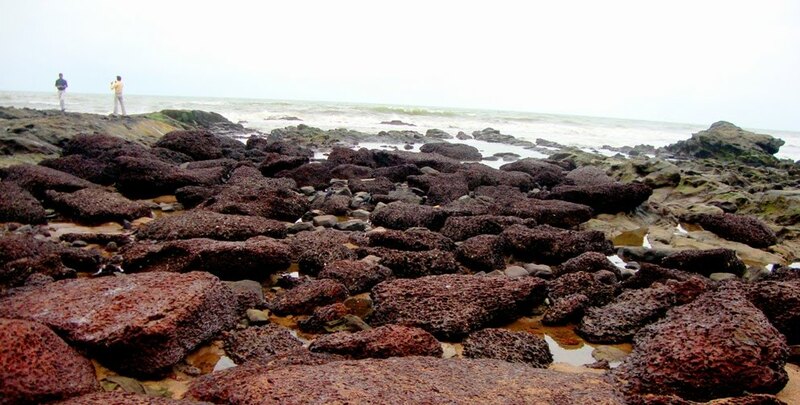 Anjuna is also a rocky beach. 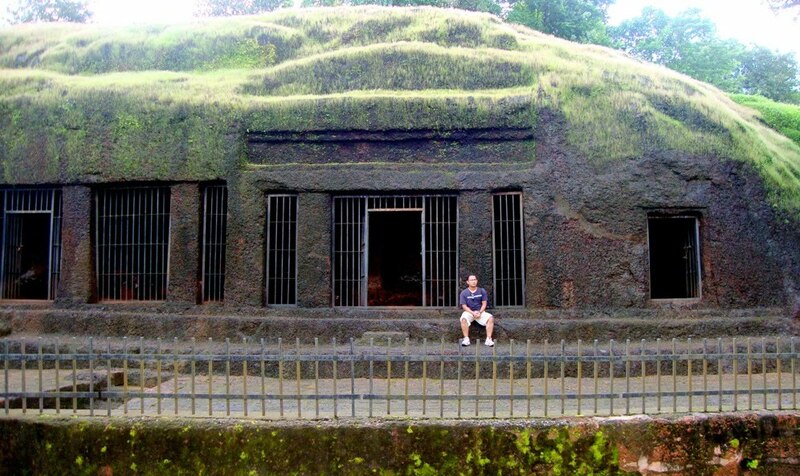 The rocks are porous (we have found these porous rocks in many places in Goa, Arvalem caves, all the forts). There were crabs all around, small ones. There were fisherman’s catching fish. Unfortunately we found a rowdy gang of youth’s so we insisted that we move on. Baga was the beach we liked most so decided to spend some time there. When we reached Baga, some of the fisherman’s boats were returning from their day’s catch. Loved the way they arranged their prized catch. Their wives came hurrying to assist. We planned for some fun in the evening, to hit the dance floor. So moved back to the hotel to change our dress. When it got dark we became the party animal. Went to the “Titto’s, where else”. They have a nice restaurant, good food & lovely music. After having our dinner it was time to hit the dance floor. After some initial inhibition, we started get going. We were already tired from the days travel, so did not stayed back late. Decided to head back to our hotel for a good night’s sleep. WOW…. Day for the religious sight seeing. Had our usual breakfast. Plan is to go to the churches. 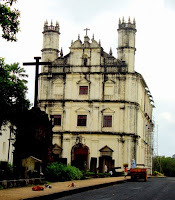 The best churches in Goa are located at old Goa. Went to Panjim and took the old Goa road. There are three famous churches in Goa – “St. Francis of Assisi, Se Cathedral Church and Basilica of Bom Jesus”. They are all located nearby in a walking distance. The church of “St. Francis of Assisi” of 1661 is noted for its unique Manueline style choir and entrance. The “Archeological Museum” located near the church is a place of must visit. They have collections of remains from 12th to 16th century. Pictures of all the governors of Goa, most of them from the old Portuguese rule. Visiting museums is always an enriching experience, as it reminds me of my countries unparalleled history which no other country in the world can boast of. 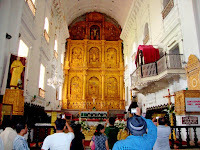 The “Se Cathedral” of 1652 is the largest church in Asia dedicated to St. Catherene. This imposing structure is famous for its vaulted interiors and Golden Bell. Golden colored sculptures surrounds every parts of the church, which was really beautiful. 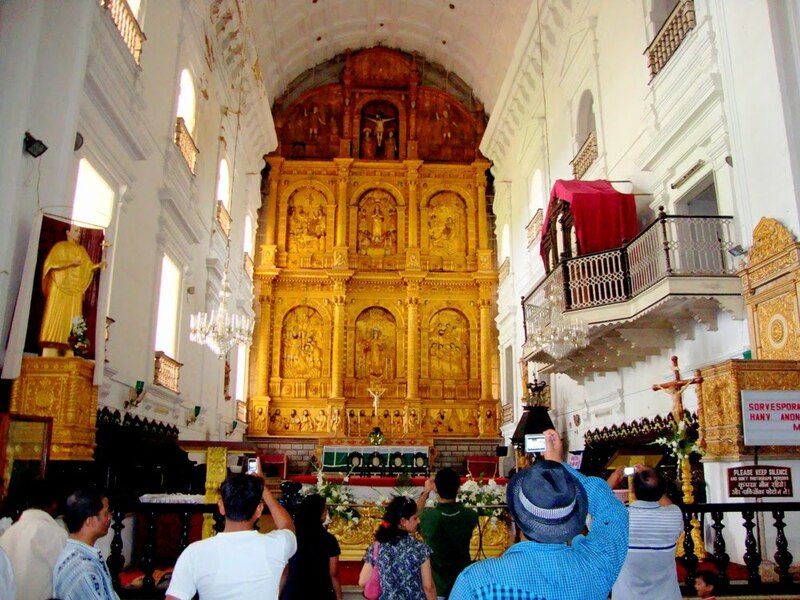 Built in the 16th century, the “Basilica of Bom Jesus” is an important shrine for the Christmas in India and Goa in particular as the mortal remains of St. Francis Xavier are preserved here. It is also a world heritage site. Further down is the “ruins of the Augustinian Monastry and Tower” which takes us back to a fascinating journey back in time. The tower must have been so huge during its time; it can be made out when we compared ourselves against it in the picture. The next stop was “Shri Mangeshi Temple”. The temple located at Pirol-Ponda dedicated to Lord Shiva boasts of an external seven-stage tower lamp. We did not spent much time there and moved ahead to the prized destination of the day. Next stoppage was Ponda. We had a stop over there for our lunch. 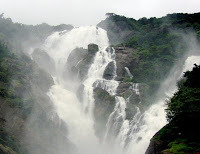 Our next destination was the “Dudhsagar Waterfalls”. 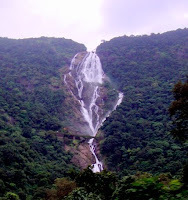 Dudhsagar waterfalls is ~ 80 kms from Candolim. Our next destination was Molem. Reached the entrance to the “Mahaveer Wildlife Sanctuary”. It was showering on and off, and we did not wanted to spend time there. We took the road to the waterfalls. This road also goes to Colem. Once we finished the last motorable location until the waterfalls, we had to look for help for going the rest of the distance. During normal season there are jeeps from the forest department that take tourists near the falls. As it was monsoon time, this facility was not available. BUT, there are folks there who were taking tourists to the waterfalls in their 2-wheeler, via a different route. They finally agreed to take us to the waterfalls for INR 720/- for both of us (INR 120 of it is for entrance fee charged by forest officials). We sat behind two bike riders and started our journey with no idea where we were going. 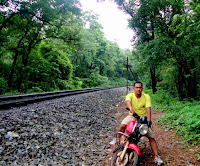 We finally reached the first scary part; they took us through almost non-existent roads besides the railway tracks. 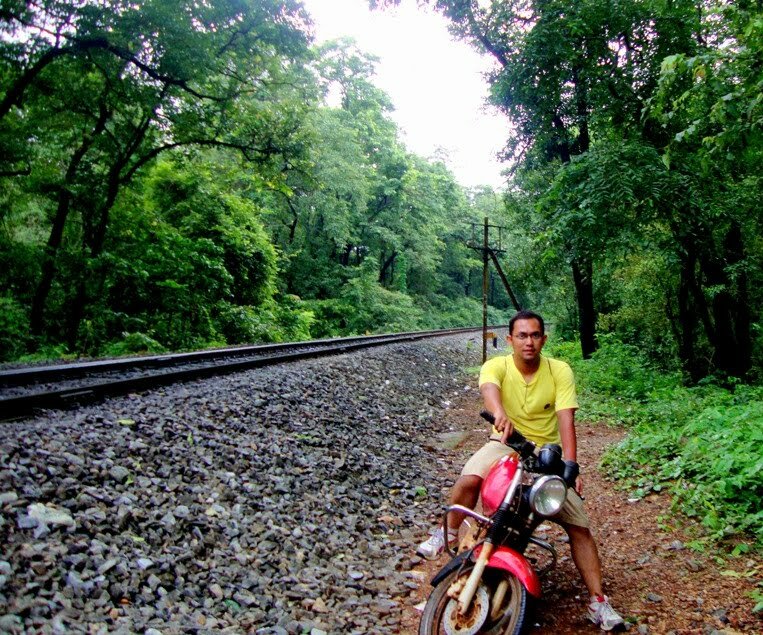 We quickly realized it’s the same track we came by on our train journey to Goa. We had to get down from the bike at few locations, as it was un-motorable (not sure how this guy’s drove that way). It did not lasted for long and we finally got into the road in the jungle. That was slightly better, but still quite bumpy. There were few streams that we had to cross, which they somehow managed. This road looked like a great trekking route. The bikes finally stopped and we thought we have reached (we must have crossed ~ 14 kms). But there was few more distance to be travelled. That was through the streams of water that had really strong currents. After crossing few of them we can see the waterfalls. All I can say was WOW. We had seen almost everything that we had planned for. We decided to see the “Tiracol Fort”. 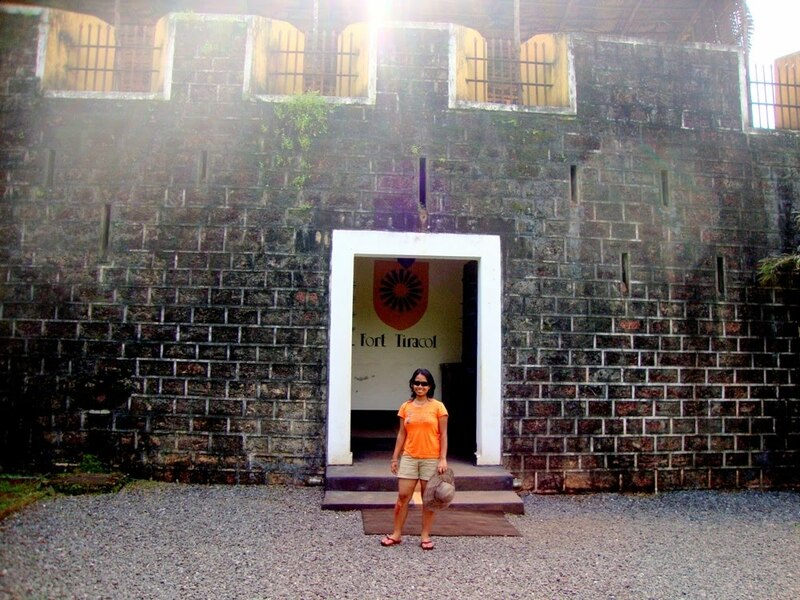 Tiracol fort was constructed by the local king and later occupied by the Portuguese in 1746. We rested for most part of the first half and hit the roads for lunch. Wanted to have our lunch at “Xavier’s” in Anjuna beach. Heard a lot about it in the web. This is located near the “Anjuna Flea Market”. The flea market was closed due to off-season. Unfortunately, Xavier’s was closed too. There was a beach shack called “Curlies Bar” that was opened at that time. The shack was filled with hippie crowd. It was a neat place with great view of the sea. Nice food and crowd. After finishing our food, started our journey once again. Went to Siolim, crossed the bridge there (there are also ferry service). Our next destination was “Kerim Beach”. It’s the northernmost beach in Goa. We had to take a ferry ride from Kerim to reach Tiracol. 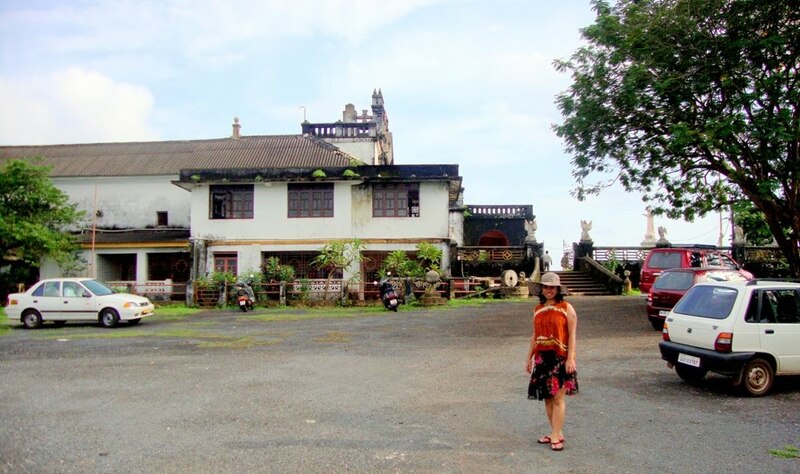 When we reached there we realized that Tiracol fort has been converted to a hotel. They do allow tourists to visit. So we decided to go in. It was really a very small place (disappointed we came so far for this). The hotel persons informed that there is a restaurant at the top where we can get a good view of the beach. We went up and sat down. He was right, it does have a great view of the Kerim beach. Relaxed there for quite some moment before deciding to come back. On our way back spent some time in Baga. Too lazy to go out, we ordered our food at the room only. This ended our great trip to Goa. Checked with reception for our checkout details for tomorrow. The reception guy offered to drop us at the Vasco railway station for INR 700/-. We agreed. Had our food and went back to sleep. Time to bid Goa goodbye. We asked us to be stopped by at the “Naval Museum” at Vasco. 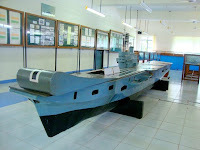 This museum was close to Vasco airport, and you will have to take a diversion from the road to the railway station. The museum was small and neatly maintained. 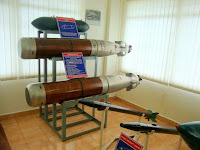 They had torpedos, communication devices and models of Naval Ship and helicopters in display. In an open-air display, they had real models of airplanes and helicopters. What a great way to end our trip. Had lunch on the way and was finally reached the railway station. The train started on time, and we bid adieu to Goa with some terrific memories. On the way back had another view of the Dudhsagar Waterfalls from the train. Captured this last moment in my digital camera. 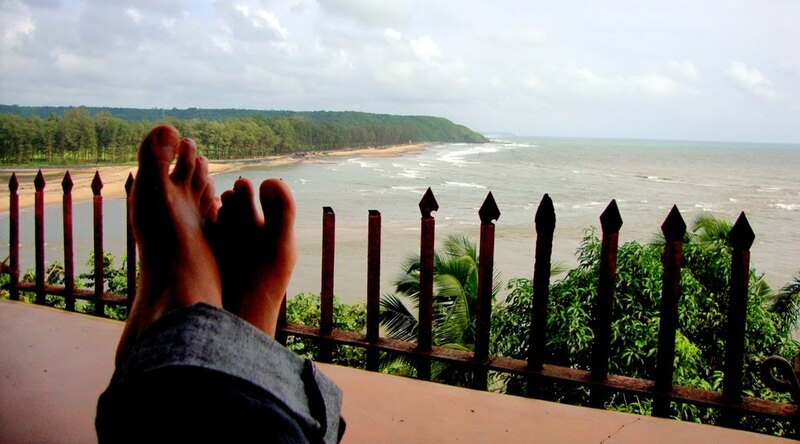 Good-bye Goa, this will be some time for us to cherish forever……..
No wonder people love coming back to Goa. Great vacation and a great anniversary for us. Hi atanu I m also from assam ,now in marathalli Bangalore .thanxx for guidance for Goa, v r going 4 OOTY on 13thFEB ,after that i will surely visit GOA..
how do you find these places! it's awesome..Already dreaming of another holiday! !anyways now i am getting very exited with all this pictures and looking forward to plan my next trip..
anyways thanks a lot for sharing this wonderful informative blog. can you tell me exactly on which dates you went ?.....Because iam planning to go in Aug 9th to Aug 17th. I read your blog. Such great information .If you find cheap flights to Delhi from New York and New York to Delhi flights in lowest price then call us now. The particular foggy and also cold weather throughout winters helps make Delhi's environment a difficult one to face along with. Delhi is situated on the banking companies of pond Yamuna along with Himalayas currently being in the north of Delhi. This is actually the main reason behind Delhi's environment currently being named for the reason that "Continental Climate". Cheap fares offer Low price flights to Delhi from New York ,Cheap fare flights to Delhi from New York and Best fare flights to Delhi From New York in very easily way.. Winter throughout Delhi can be quite cold which often peaks throughout at the start of December and also persists until eventually your thirty days of March. very good post thanks a lot. goa is absolutely amazing Indian tourist place. Goa is a delightful place to be with friends. nice blog, thanks for informations about goa holiday, Book online Goa holiday package at discounted prices to make your trip exciting with your friend. I may be planning to visit Goa next year, have heard there are lots of places to visit in Goa such as plenty of beaches, churches, flea markets etc. Everybody wants to visit Goa on vacation time and We can’t ignore that Goa is the best tourist place of India, I also visited two times in same year & I can’t forget beaches in Goa. 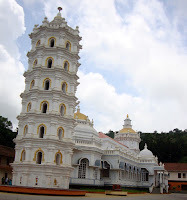 Above Goa tourist places details are very useful. Actually Goa is a land of the God gifted. 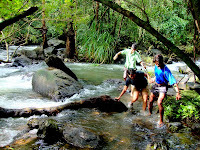 Tanu Travels http://www.tanutravels.com offer Goa state tour packages with affordable rate. Hello Sir wanna to discuss with you for blog posting my content if you are interested so please contact me in my mail saras.seospecializer@gmail.com . Goa is a amazing spot to travel. i love to travel in goa.. best destination in the world. Nice post about goa. I like your pictures too. Thank for sharing the details of your adventure. Hey nice blog!! We checked many Self drive car rental rates when had visit in Delhi, and landed to Voler cars I got a good service and the price was optimum from Voler Cars.If i get a car hired for rs. 30 per hour isn't it cool? 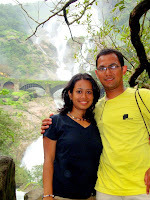 Thanks for sharing your experience , you had a great fun in your tour , Goa is really a beautiful place to visit in India. I really glad to read your information about goa with amazing beaches snap. Explore more places with Tour Packages for Goa . Great article, It is fantastic article provide a nice article experience and share a lot of memories and information. All the picture in this post is excellent, Golden Triangle Tour 4 Days provide the best and memorable tour package. It is the nice article and all the destination is the best places for tourist. Great shared i really like it doing good job. botanix nature resort what an post man. Great shared i really like your post. it's very helpful thanks for sharing blog. corporate day outing near delhi Great picnic spot in delhi ncr. Nice experience! me and my friends are planning to go and we have booked are Goa Packages from Ahmedabad. We were wondering if you could help us know how to go about the water sports booking in advance and whom to contact etc. Beautiful tiny state in southwest of Goa is famous for glorious beaches (in both north and south Goa), dense vegetation, exotic flea markets an exquisite gardens. Budget Hotels In Goa only for its amazing views﻿ and it was fantastic. Goa is the best travel tour, We provide hotels in Goa at affordable prices. With such package, your vacation will surely be memorable. Thanks for sharing this wonderful blog with us. I am glad to see your blog. Keep posting like this. The blog is very good. Well Written and yes there are so many beautiful pictures in the blog of different places you travelled. I like your blog very much it is interesting . Goa is a beautiful place to explore with friends and family. Travelling in and around Goa and exploring different places by car rental services or taxi services is fun. 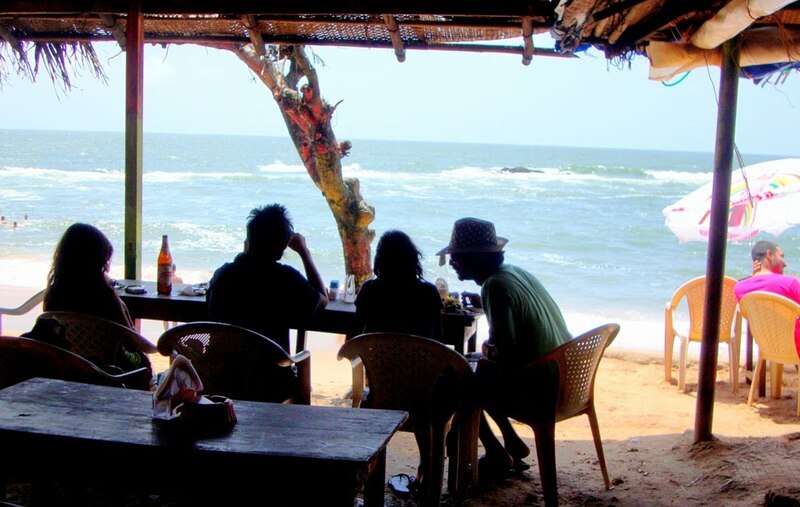 Well written about Goa, thanks for sharing more information about Goa. I loved reading this blog. Goa is one of the best place to visit. Visit to those places by booking your tickets in Paulo Travels. The content of your blog was very interesting and engaging. For discussion on such kind of informative topics, you can visit My GOA Trip : An Amazing Experience request you to keep writing on such varied topics. Tempo Traveller on rent in Gurgaon , Tempo Traveller on rent in Noida , Tempo Traveller on rent in Ghaziabad , Tempo Traveller on rent in Faridabad , Tempo Traveller for easy travel. This is a very information post about Goa Tour. Thanks for sharing it with us. Keep update such types of information. Great blog om Goa tour! Goa is most busiest tourist destination in India to tour and visit, there are many good tourist places in Goa to tour, to travel around the places tourists are advised to hire a good professional travel agency to make the tour memorable. Arabian Time Travel Tourism Reviews is one of the best travel agency ( https://www.youtube.com/watch?v=Jzby6TrHyNU ), tourists had a good trip with Arabian Time Travel Tourism Reviews. Best Goa Holiday Tour packages – Get the best Tour and holiday package deals for Goa, the top tourist place at affordable price by Trinetra Tours. For exclusive packages contact us now! Great post and pictures you captured.. Goa is an ideal destination for your vacation, be it with friends or family. If anyone want to visit Goa the book this trip with Golden Triangle Tour with Goa is the perfect option to travel. Goa Tour Operator are widely put up by Local Goa Tour Operators which includes Family, Honeymoon, and Holiday etc. Plan your holiday with Travel Tourister and seize the winsome deals.